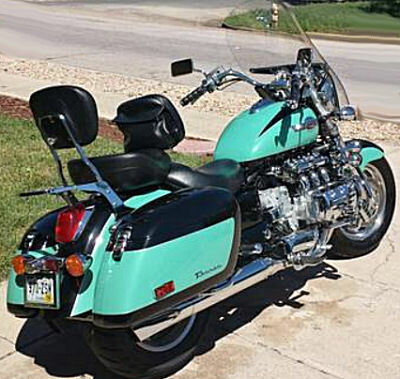 The 1998 Honda Valkyrie for sale has a beautiful teal and black paint color and less than 14,000 miles. The bike is in showroom condition PLUS, it has some nice accessories including: chrome extras, engine guard, highway pegs, an aftermarket Ultimate passenger seat, an aftermarket horn, waterproof cell phone handlebar case and matching fiberglass saddlebags. motorcycle lift/jack and the 1998 Honda Valkyrie owners manual. From the two-tone paint job to the nice extras; this Valkyrie Touring Edition is gorgeous! Those of you that know a thing or two about this tourer can use the comments form below this ad to write a review or voice any opinions that you may have formed from your personal experiences with a motorcycle similar to the 98 model Valkyrie listing any problems with its performance, where to find used Honda Valkyrie parts or anything of interest that you feel potential buyers should be made aware of. Thanks for visiting GoGoCycles Used Motorcycles for Sale and for your interest in the 1998 Honda Valkyrie. The location of the tourer for sale is in the Austin Bluffs and Union area and in my opinion you will have to try hard to beat my asking price of $7500 on Craigslist or Ebay! If you want to take a look or have questions, call me (NO EMAILS) at 719 233-4five67 for more details or to request picture and don't forget to mention that you found this ad on GoGoCycles Used Motorcycles and Parts for Sale www.gogocycles.com.